"Highly entertaining romp with great characters and charming romance!" 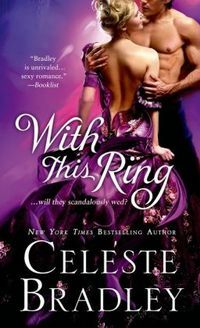 WITH THIS RING is Book three in Celeste Bradley's Worthington series. I believe this story can still be enjoyed without having read the previous stories in this series. As I read this book, I was charmed by both the hero and heroine. At first I thought that WITH THIS RING would be a conventional historical romance, but Aaron and Elektra surprised me. How can you not love a heroine who takes matters into her own hands and whose introduction to the hero is when she points a loaded pistol at him after abducting him? In WITH THIS RING, nobody is who they appear to be. This makes for some almost farcical moments, but it also helps define who the characters really are. Lord Aaron Arbogast is returning from a ten year exile a more cautious, purpose- filled man than when he went away. He left England years ago as a young man hounded by scandal and the notorious moniker "Black Aaron". The complete details surrounding that scandal are finally revealed toward the end. However, one thing he has in common with Elektra is an inflated sense of guilt and responsibility. Aaron has spent years trying to be, what he believes to be, a better man in order to gain the approval of his grandfather and thus claim his full inheritance. In Elektra's case, she takes it upon herself to try to restore her family's fortune and good name. I love that Aaron saw the real Elektra. Some family members see her as frivolous and not interested in anything serious. He is able to see past the surface to the good person she really is and that everything she does is for the benefit of her family -- most especially her youngest sister. That elevates his desirability in my eyes. They both see the best in each other. I think the ruse involving Aaron posing as his valet Henry Hastings, and his valet pretending to be Lord Aaron Arbogast, is entertaining. I think Aaron continues with it for as long as he does is because it gives him some freedom to be himself and get out from under the "Black Aaron" cloud. The secondary storyline involving the real Henry Hastings and the romance that develops between him and the maid is charming. I don't think that the romance between Aaron and Elektra would work for me if I didn't like the main characters as much as I do. Thankfully for me, they turned out to be fabulous. However he may have been when he was younger, Aaron is very gallant and quick to come to a lady's assistance. I also think he's a total sweetie and very self- aware when it comes to his feelings, especially his feelings for Elektra. I found the way she flabbergasted him to be adorable. I was worried that Elektra would turn out to be shallow, but that is not the case. As the story wore on, she impressed me as being a very strong woman who makes a plan and goes after what she wants, while still having a tender heart when it comes to those she cares about. WITH THIS RING is a charming and very romantic story with lots of laughs along the way. The ending puts a perfect cap on the story. I look forward to reading more books in this series to see what happens to some of my favorite supporting characters like Elektra's brother Lysander and her cousin Bliss. Elektra Worthington is the lovely middle daughter of the eccentric, impoverished Worthington family. Her beauty means nothing to her except as her currency to return the Worthington name to its former glory of status, riches, and dominance in the ballrooms of Regency England. To this end, she will stop at nothing�even if she must kidnap a rich lord in the process. If this lucky gentleman is just returning from a long absence and knows nothing of the Worthington reputation, well, a girl shouldn�t look a gift lord in the mouth�right?